The Bible had me in a crazy awesome thought today. I was reminded of the story of Joseph. You know, the guy who dreamed a lot and wore the multi-colored coat. In case you’re unfamiliar with the story, it’s found in Genesis 37-46. To try and sum up the story, it’s about the youngest son of a man who has 12 children. Not only is he subject to all of the “youngest” stigmas (babied by his mother, favored by his father, bullied by his older brothers, etc.) he was given the gift of dreams and interpreting dreams that would foretell the future. One night Joseph woke up from a dream that foretold of his impending rise to leadership over Egypt, Israel and even his whole household (which, culturally at the time was unheard of. The youngest of 12 leading over the 1st born. It never happened). God spoke to him through this dream though, and Joseph believed to his very core that this was where God was leading him. It would probably surprise you as much as it did Joseph to learn that his brothers turned on him after telling them of this dream. They bound him and sold him into slavery in the land of Egypt. He was a slave for years, accused of things he never did, thrown into dungeons. It wasn’t until he was brought before Pharaoh himself that he began to see how God was still working and moving in his life to fulfill the dream that God had given him all those years ago. He interpreted Pharaoh’s dream of a coming drought that would last throughout the land for 7 years. Pharaoh then put Joseph in charge of all food and rations and put him only second to Pharaoh himself. God fulfilled his promise that he made to Joseph in his dream all those years ago. But God brought Joseph low before he brought him high. Often times in our lives we find ourselves in the lows. Wondering if God is really going to fulfill the prayer we truly believe He answered or the calling we truly believe he’s called us to. For the past four years Courtney and I have held fast to the call in our lives that being on staff with Cru is where God wants us. Where he’s called us to be. We’ve been in, and through, the lows. For almost three of the past four years we have been raising our monthly financial support full-time. The whole time believing that God was still calling us to work full-time on the college campus, sharing and teaching the Gospel to college students. During this time the Lord was testing our faith and commitment to the call that He’s put on our lives. However, I believe this “low” to have truly been a high when looking back on it. Yes, it was difficult, and at times Courtney and I would say to ourselves, “this is not what we signed up for.” But in the midst of it all — God was faithful. He used those times to show us what we’re really made of, and we quickly found that it wasn’t as much as we thought. If it hadn’t been for the strength of the Holy Spirit inside us, I don’t know if we would have had the resolve to still be where we are today. Often times we compare trials in our lives to working-out or training for a big race. It’s a cliché comparison — “what doesn’t kill you makes you stronger” — but it’s true. The difficult things we experience that we push and pray through, but still make it out whole on the other side, are the things that refine and define us. God is constantly making sure that we’re as “all in” like He is. At least I believe that to be part of the reason God brings us to a trial and we follow His leading. In our lives, like Joseph, God was faithful to us in the dream and vision that He gave us for being on staff with Cru sharing and teaching the Gospel to college students. The Lord wants good things for His beloved children (Romans 8:28). Trust and believe in that as you experience trials in your life. Take a few moments the next time you’re in the thick of it all. Ask yourself if this is worth the costs of the call that God has placed on your life, or is he trying to get your attention to pull up anchor and set sail to somewhere new? Courtney here. I’ve been writing this post in my head for nearly two weeks. I’ve been trying to put into words what I’ve been thinking and feeling, and I realized I couldn’t sensor anything. I’m gonna be really honest with you this morning. Have you ever done this before? Let me tell you that it is a stupid idea, and bad habit that never produces greater courage or rest. It only tempts me to wonder if I have what it takes, and pushes me to try to control things that I can not control. I cannot control how much longer it will take to raise our financial support. We’re still waiting. And that’s hard. That’s the truth. It’s hard. I’ve had to ask myself this question — what does it look like to wait in a way that makes me a participant in what God is doing, rather than someone who struggles against the wait? We’re waiting on the Lord to send us into the ministry we “really” want to do, what He called us to do — serve on college campuses to help turn lost students into Christ-centered laborers. We were propelled by a biblical vision to do this. This wasn’t our idea. It was His. For so long, I felt that I was “missing out” on ministry because I wasn’t the one on campus sharing the Gospel and leading Bible studies. But the Lord didn’t just call me to share the Gospel with college students. He doesn’t need me to do that. God invited me to join in His mission. I confess that until recently, I was missing this point. Again, the Lord didn’t just call me to share the Gospel with college students. The Lord called me to love Him, follow Him, and trust Him. He never said it’d work out the way I wanted. He never said that it’d be easy. In fact, He said following Him would be more difficult. All that to say — never did it cross my mind that in September 2011, we’d still be in Minneapolis, raising our last leg of support, and having no clue when the end would come. In my moments of weakness, I throw a tantrum because I’m still waiting. No joke. A tantrum. I sit in a corner, cry, and yell at no one and nothing in particular. Maybe I’m yelling at God. You know, stuff like that. Really selfish, “all about me” questions. It’s beyond ridiculous, sinful, and in no way glorifying to the Lord. Waiting has brought me to the edge of craziness. It has brought me to the peak of my capacity. It has revealed my deep, dark sins that I hid away from everyone, including myself. Only by God’s grace am I here. I’ve learned — and continue to learn — the hard way. I’m exactly where the Lord wants me, and I was not singled out. In fact, I have a lot of company in this waiting game. Abraham waited years for his promised son. Israel waited 420 years for deliverance from Egypt, then another 40 before they could enter the land God had promised them. God’s people waited generation after generation for the Messiah, and the church now waits for his return. Waiting is not an interruption of God’s plan. It is His plan. We just don’t always like it. We don’t like it because all the control is in God’s hands. I know many of you can identify with me on this, but I’m someone who likes to have control. For example, I have control over my efforts. I believe that the harder I work, the more funding we’ll see come in. More effort = more success. But the problem with this way of thinking is that it isn’t reality. The reality is that I don’t have any control. I can work my tail off making 200 dials a week, sending emails, mailing letters, etc., but it wouldn’t make a bit of difference if the Lord didn’t want it to. Our God holds the world in His hands and does whatever He pleases. What I should really do is celebrate this. The constant striving in ministry to be a little god over some corner of creation is draining and futile. Waiting should actually be a relief. It’s a reminder that I don’t have as much power and control as I thought I had. I’ve come to the realization that my ministry is either propelled by hope-motivating rest in God’s sovereignty, or fear-inducing belief that success would be the result of me controlling everything. These two thoughts do not go together. The Lord has called me to wait, and He is with me in my wait. He hasn’t gone off to do something else. No, God is near, and He provides for me all that I need to be able to be right here. I have come to live in complete fear of the Lord. I stand in awe of His amazing power. He is meeting me in one of the most difficult hallways of my life. He kneels down before me in love, and asks me to trust His loving and wise rule, even though I don’t have a clue what He is doing. God is committed to the countless ways, large and small, in which His grace is at work to accomplish His purposes in me. When it comes to the ongoing work of grace, He is a dissatisfied Redeemer. He will exercise His power in whatever way necessary so I can be fully redeemed from this broken world, and delivered from the sin that has held me down. I celebrate the fact that God does not forsake the process of grace in my life in order to deliver me to momentary comfort, pleasure, and ease that I’d rather have when I’m exhausted, discouraged and weak. He simply loves me too much to exchange temporary gratification for eternal glory! Waiting has provided an opportunity to know God better through spending time in his Word, thus developing a deeper sense of His character, wisdom, power, and plan. I’ve also recognized that waiting is an opportunity to know myself better. I’ve become a student of my own heart. The sins, weaknesses, and struggles God’s revealed to me. He’s exposed the lies and false gods that made waiting difficult. He knows there are times when I wish I could write my own story. He knows that at times I will be overwhelmed by what is on my plate. He knows that His plan will confuse and confound me. And He knows that real rest cannot be found in understanding. Real rest is found in trust. He is willing to have the conversation with me again and again, and He has made sure that His Word assures me of his rule again and again. God is not so much after the success of my ministry, but He’s after me. So as I wait, I tell myself again and again: Waiting is not just about what I get at the end of the wait, but about who I become as I wait. Note: Paul Tripp, a contributing writer to The Gospel Coalition, has written a few essays over the course of the last month that worked together with God’s Word to shepherd my understanding of what the Lord was teaching me. Some of my words written here were his thoughts. Thanks Paul. Today we wanted to share with you what’s going on with our support raising, our goals, and overall, just how we’re feeling. First, we’re feeling excited, hopeful, focused, energized and encouraged. Honest. That’s where our hearts are at. Praise God. If you’ve been praying those things for us — thank you. Here’s proof that our God is awesome and provides great things for His children. We are trusting God to be on the UW-Stevens Point campus in time for the fall semester. That’s in a week. Currently, we have 75 percent of our monthly financial goal. We’re trusting Him for big things. We’re waiting, praying and trusting in His will. We praise Him and we know and trust in His goodness. We’ve experienced His affirmation in our call. He has us where He has us because it is His will. We serve an Awesome God and trust Him with a heart of gladness. We wanted to invite you to trust in Him with us, and join us as we pray to see our final 25 percent come in so we can be on campus this fall. Pray that God would continue to encourage, sustain and provide for us. Only by His grace and Spirit have we seen these two years through, and continue to be excited by fundraising (it’s true! we still are!). Pray that our hearts would be humble before Him, and that we would continue to see His goodness as we raise our support. We’re waiting to hear back from two church missions boards about financial support. Pray that we would receive answers from them this week, that each would join our team financially, and that our hearts would be prepared for their response. 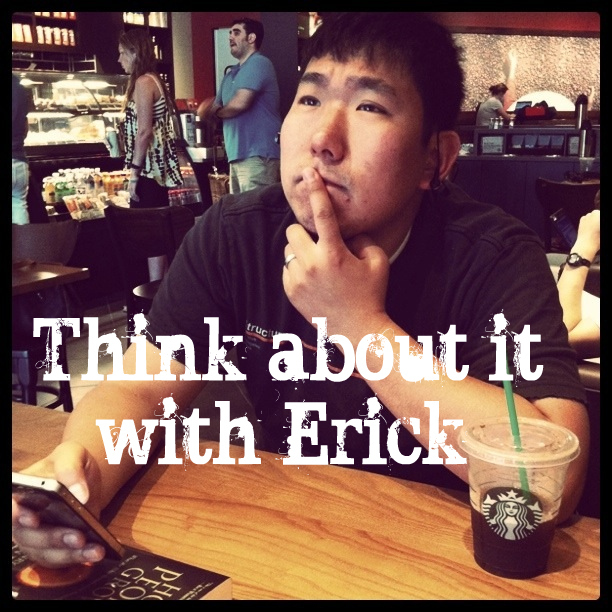 Pray for Erick tomorrow as he meets with another local pastor in St. Paul. This pastor shepherds one of the largest Hmong Christian churches in the Twin Cities. Pray that Erick would be filled with the Holy Spirit as he casts vision for our need, and how we can partner with this church through the ministry at UW-Stevens Point. We still have nearly 100 contacts we’re working to connect with — praise the Lord!! Pray that God would lay our ministry on the hearts of those we’ve been calling, and the new referrals we received last week. Pray that they would answer their phones, would be available to meet with us, and can join financially and in prayer. Thanks for reading this, praying for us, and supporting us. We’ve said it before — but don’t say it often enough — we can’t do this without you. And to those who’ve had a front-row seat to this adventure, we praise our God for you. He has shown His love for us through your friendship, truth, grace and encouragement. Lately, many people have been asking us, “how is support coming along?” If we had a penny for every time someone asked us this question, we’d have a lot of copper in our possession. We appreciate you asking. It encourages us to know that you’re thinking about us, praying for us, and are in this ministry with us. As we’ve said so many times before, we couldn’t do what we do without you. As you are probably aware, Courtney and I are still in the process of raising up our initial ministry team. This team will support us both in prayer, as well as financially, throughout our ministry with Campus Crusade for Christ in the Central Wisconsin area. Currently, we have a little less than 70% of our financial need committed. Praise the Lord! But we’re not done yet. “In his heart a man plans his course, but the Lord determines his steps.” – Proverbs 16:9. The Lord has more planned for us in this season. We wouldn’t have planned to be in month 21 — but alas, here we are. We are more amazed every day in the way God meets our needs, challenges us to step out in our faith, and lead us to individuals who need to be encouraged by His love. Here’s an update on the oars in the water, and specifics you can be praying for us. It’s all hands on deck people — here’s the scoop. Recently, we’ve been pointed to two pockets of new contacts and referrals (nearly 200 people) for us to connect with; these were clear gifts from the Lord, and God has His hand over how we recieved them, and how fruitful they’ve been. Please continue to pray that we can connect quickly with this individuals, and that they would join our team financially. We recently met with a church missions pastor here in Minneapolis. He said our current team of 70% of financial partners is encouraging to him. Our current ministry team is 100% individuals and families. He was amazed that no significant support comes from a church or business, but we are still 2/3 done with our funding. Please pray that some of our remaining 30% can be fulfilled by the two churches who have heard our stories in the past week, and that they would be a part of our financial team. We are praying to be completely done with our initial support raising by the end of July. We have a Campus Crusade National Conference this summer in Colorado, and our prayer is to be fully-funded by the time we leave for the conference. Jesus is worthy of our lives, and this work with our ministry is worth it. It’s been a long road, but honestly, the time we’ve had with the Lord, with each other, and the people we continue to meet, is priceless. We wouldn’t want it any other way. All of you who support us, whether it be through financial or prayer support, have blessed our ministry. You have brought us to this amazing place. Thank you so much! Please be praying that God would continue to shine His favor on us, our ministry, and our ministry partners (that’s you! :-D) as we connect with more and more individuals to partner with us all in reaching college students with the message of Jesus Christ. So sorry friends. We don’t have a good excuse. Does anyone even say “by golly” anymore? I’m sorry again for making that retro phrase pop out of your mouth. Apparently I’m channelling, “Leave it to Beaver” this morning. Happy Monday to you. Happy Spring too. 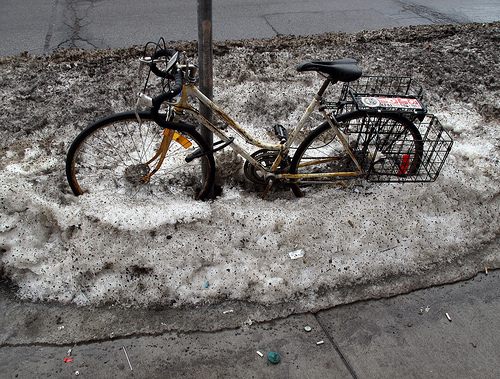 Though, it isn’t very springy in Minneapolis. It’s cloudy, 40-degrees, and snow still covers my yard. It’s ugly snow too. Check out Nicollet Avenue. Gross. My brother Kyle and his lovely girlfriend are in Florida for the week. Needless to say I’m incredibly jealous. As a consolation, Kyle said he’d ride an extra roller coaster in honor me. Thanks brother, but instead, could you possibly bring back sunshine and 80-degree weather? That’d be swell. What’s new in our lives these days? We’re still raising our support — we did not finish on March 15. Yes, it’s disappointing and we were hopeful to be done. But God isn’t done with us yet. If He wanted to, we know God is capable of having us finish tomorrow. But, He has some more things up His sleeve. We do have to be honest with you, there were moments this last week — out of pure exhaustion, frustration and disappointment — we didn’t know how God would give us the strength and vision to press on. Support raising is hard. Anyone who tells you otherwise is totally pulling your leg. But it really is worth it and we wouldn’t want it any other way. It’s like going to the gym for a really hard workout. You know it’s good for you, you know it will make those pants you’ve been wanting to wear look fantastic, but in the moment, while you’re doing it, you’d much rather be eating ice cream while watching “Biggest Loser.” Watching people workout counts, right?! But, we watched the Lord do so much in this 10-week season of praying for this goal. Our monthly support grew 10 percent, we stepped out and took some risks we never thought we’d do, and we experienced the Lord more intimately than we ever have before. Thanks for praying. You really are the best. We’ll continue to keep you updated. Please pray for renewed vision for us this week. Pray for support appointments and more contacts. Pray for intimacy with the Lord. Also, please let us know how we can be praying for you. We like to hear from you too. 🙂 Blessings friends. Here is what we’ve learned. Wedding pictures = lots of web traffic. I really wanted you to read this post so … here’s another pic for you. 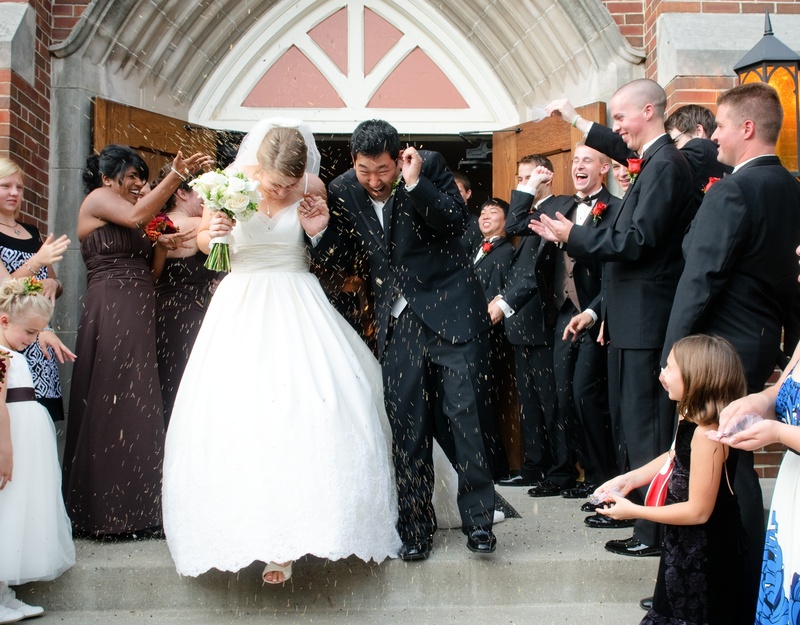 This one is of our wedding party throwing birdseed at us — notice the absolute glee on the faces of the groomsmen. Particularly Jordan Bell. Just a word of warning to all you engaged folks out there — birdseed is traditional and a lot of fun for everyone, but it hurts. Like, real bad. And it also creates kodak moments like this lovely picture. 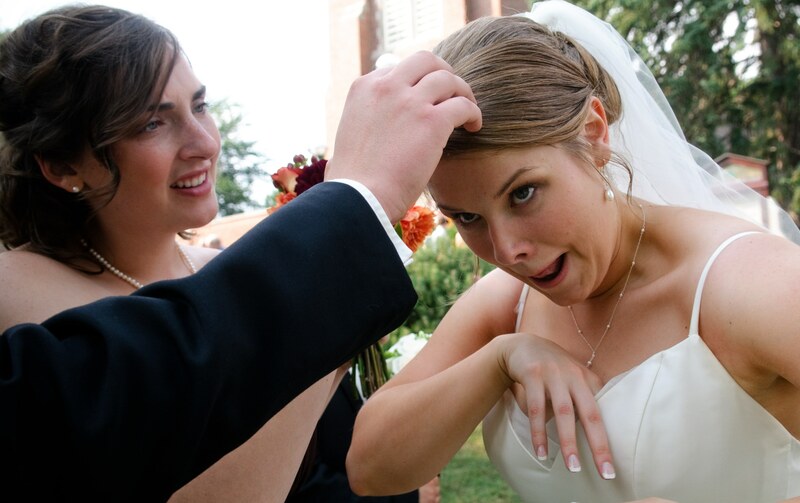 My maid of honor and fellow groomsmen had to pick seed from my hair. It was awesome…. Anyways, after I shamelessly lured you here with our wedding pictures, the real reason for the post is to ask you to pray. We’re trusting the Lord to be done raising our financial support by Tuesday, March 15. Will you pray with us? We are currently at 60 percent. This is a big prayer, but we know the Lord could bring in our funding by tomorrow if He wanted to. We have a lot of oars in the water right now, and we’re trusting God to soften the hearts of the individuals, families, churches and businesses we’ve asked to meet with us, and be a part of our team. Will you pray that we would come to mind for the potential partners we currently know of, and those we haven’t had the opportunity to ask yet? We’re trusting God for 40 percent of our monthly needs to come in by March 15. It’s a lot — but this is all about His timing and we trust Him. What will happen if the funding doesn’t come in by March 15th? We praise God for all He has done in this season, and we will keep on plugging away. We continue to learn so much about God, about ourselves, and about where the Lord is leading us throughout this process. We have never been more on our knees, more in need of God’s grace, and more stretched and pulled to our spiritual and emotional limits. Working out and stretching produce flexibility and faithful endurance. Vital components to a successful ministry. Thanks for praying with us friends. We couldn’t do what we do without you.